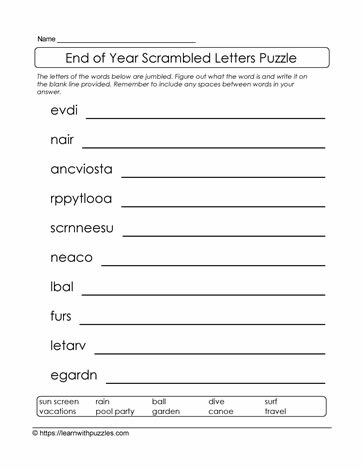 Here is an end of year jumbled letters puzzle to keep kids engaged during the last month of school before summer holidays. Make the puzzle more challenging for kids by hiding or removing the list of words in the word bank. This requires them to include current knowledge and understanding of words that are related to the end of the school year while unscrambling the letters to form known words. Once letters are unscrambled, students record their answers on the line. Remember to add capital letters, as required, and include spaces between words.